Submitted by ChaosQueen_Kara_8 on 2019-01-21 19:54.
do nicely! --- See the screenshots for a peek at what you get in this reskin! * Realistic looking lava that plays nicely with the heat effect that it gives off. * Flesh Mushrooms... or would that be Fleshrooms? Definitely not edible. * Snake-skin ropes... or are they snakes being used for ropes? You never know. * H.R. Giger-style cavern walls (because nothging says "alien" quite like Giger!). Other textures in a decidedly Giger style cover things such as the fences. * Stalactites made from Demonic Souls, and some rocks and walls made of them too. * Techno-Organic tendrils for the 2X2 Portal. * Obsidian material for the 1X2 Pillars, decorated with dark arcane symbols. * Reflective emerald green crystals with a cool scale-like pattern on them. * Hellraiser-style "Puzzle Box" textures for all crates in the tileset. * Gold metal cauldron with Babylonian writing upon it, for Platform 2 2X2. * Demonic roof patterns for all of the buildings, such the huts and things. 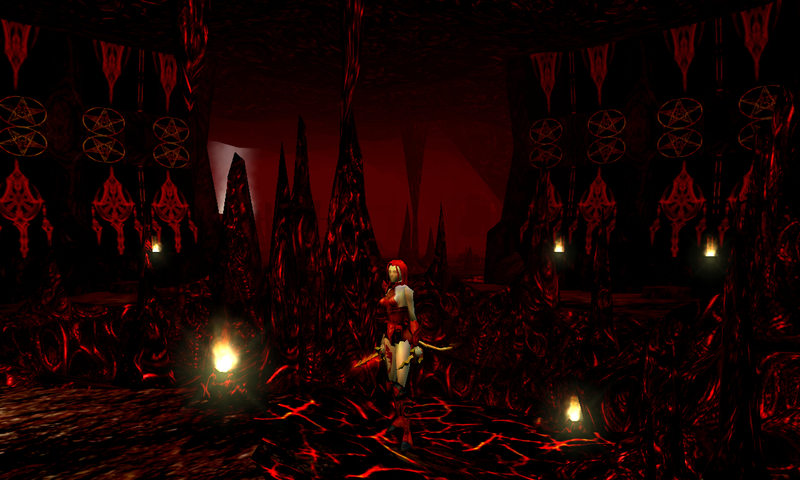 * Many other beautifully infernal textures abound, waiting to be discovered! All in all, quite the striking facelift that looks incredible in-game. 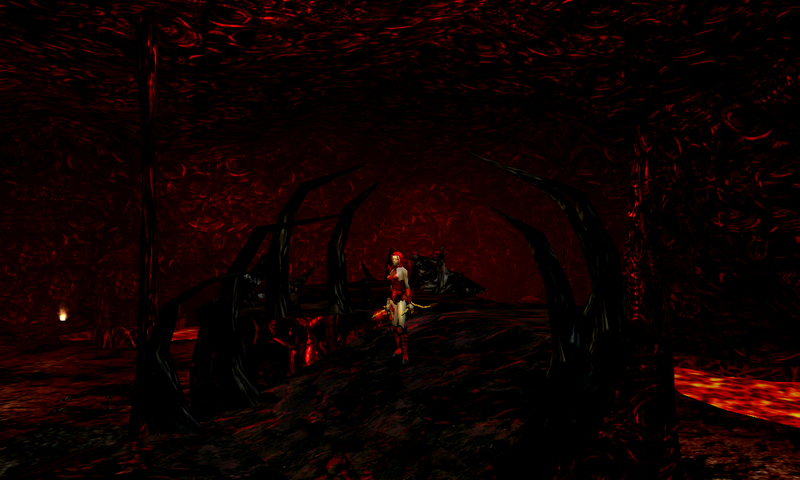 --- Created using the Neverwinter Nights Enhanced Edition. Click on Terrain, and then choose Eraser. Left-click on any empty floor tile in the area and keep clicking as you cycle through the different terrain types (like the rock pillars, lava pools, steamy pits, etc.) and one of them will be the Mineshaft. Since there was no need for two ways to plae the Mineshaft, the old entry for it under Features was removed and is now blank. This is by design. This looks very promising. I might have to go outer-planar for a bit. I truly appreciate some of the nuances you worked in there. Like all good tilesets, it left me wanting more. Well done, and I nice addition to the Vault Community. Thank you for sharing your love. Late Edit: How much harder would it be to add some fluidity to the lava? It seems a bit static. I am very happy to see how much you liked my latest Tileset project! This one was a lot of fun to work on I must admit. I've always loved the Outer Planes settings, myself... a lot of divesity and creativity is possible with anything relating to them from a builder's and content creator's perspective. And that means a lot of fun for builders and players as well! 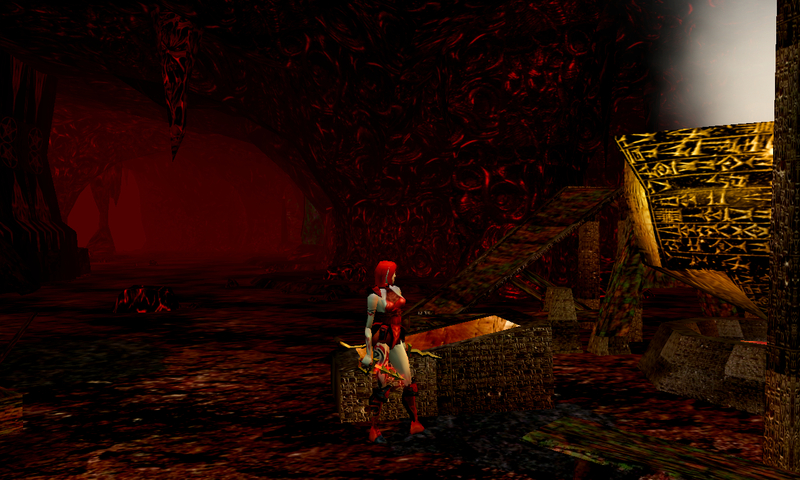 I've always been curious about how to add more fluidity to things like water and lava and such with Neverwinter Nights... the tricky part with a reskin is that you are basically just replacing default or existing textures with brand new ones but the models themselves basically stay the same for the most part. So, I would imagine the static state of the lava has to do with the static state of the water in the original Mines and Caverns tileset... which would likely be related to the water itself not having animations attached to it unlike the water in the TNO tileset that seems a LOT more alive. Now it *might* be possible, at least theoretically... to replace the water in the Mines and Caverns tileset with the TNO water, fluidity and all, and then add the lava textures over that with them using the animations from the TNO variant. But, of course, it may also end up being that it only changes things on a cosmetic level and not on an animated level... if it should turn out that the animations for the TNO water are based on information in the tileset's .set file, which is a possibility. In that event, there would not be too much that could be done without having to edit the Mines and Caverns tilseset a lot more extensively. But, I will definitely conduct some experiments later on and see what I can come up with. 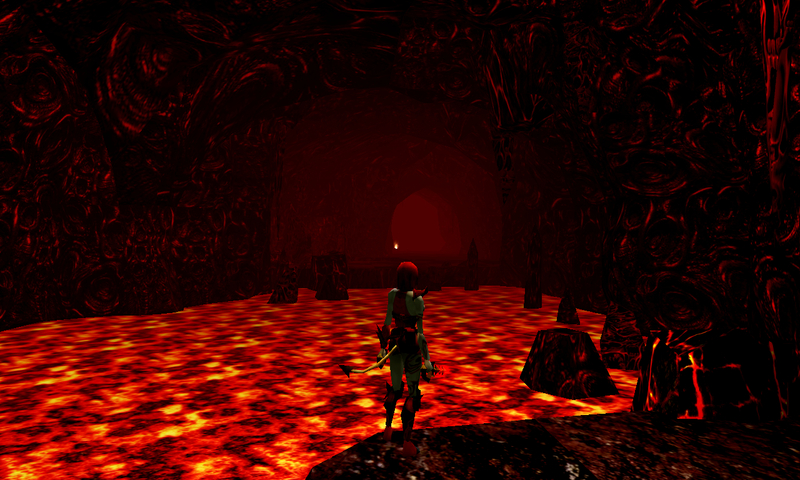 If I do manage to create a more "alive" look for the lava in my Infernal Caverns project I will most certainly release an updated version containing the upgraded and updated feature. If nothing else... I'll be learning a lot more about how the water-based textures and models work, and that can never go amiss. Perfect timing as we have been wanting to do some infernal areas to go with WoRms Scorched Earth and provide some hot hunting areas!! I am glad I got my Infernal Caverns out just in time for you to make use of... it was very fortuitous timing indeed! I love the WoRms tilsets also... quite spectacular stuff. Very beautiful work done with love. sumptuous. really very well done ! and i confirm it works equally well w/the old [non-e.e.] nwn. I thought it would work well in the old game too... most things tend to be backwards-compatible content-wise except for the projects that delve into the Specular end of things and such. But of course, this was not one such of those, so very high level of compatibility which is excellent. :) Very, very pleased that you liked my Infernal Caverns so much! The color is too dark. To really appreciate it, the builder must use exterior clear. Torchlit only is way too dark. missing areag.ini - no default sound, music, visual (which works best? ), interior or exterior settings, etc. And finally, which tile has the lament configuration? I couldn't find it. Also, it's too bad that you didn't reskin the humanoid huts, or at least the wall ones. It would've been cool if they were made of stretched humanoid skin. Looking forward to the next version! 1. It was intended to be dark. If you ever played the Agony game this was inspired by that was how Hell was portrayed it it... as having an oppressive darkness to it. Changing the area light, as I did for my screenshots, to be just so makes it so that a builder can adjust an area's lighting to match their individual tastes. So lighter areas with this tileset can be built. 2. You can change what music you want an area to use when you build with it in the Toolset. Whatever sound or music works best depends entirely on what a builder has in mind when deciding to create an area using any given tileset. All an areag.ini file does is put in place a baisc concept... which most builders typically change anyway during building. 3. As noted above, the static lava is due to the static nature of the water model itself. I will be conducting experiments later on to see what... if anything... can be done about that. In any case, it will be fun and interesting to see what I can discover about working with that aspect of content creation. Learning new things can never go amiss, I alway ssay! 4. Actually, the mineshafts painted down in the toolset with no issues at all for me... and I tested it thoroughly prior to release in order to do the screenshots. For me, it worked as it always did in the default Mines and Caverns tileset. In fact... I made sure to select and place every tile group and object in my test areas so that I could be sure it all worked well. 5. The doors use legacy textures because their entries in the tileset's .set file link to the game's default doors for the Mines and Caverns tileset. That, in turn, is because no new door models were created for this tileset due to it being, conceptionally, a simple reskin rather than a new "from scratch" project. This is actually a thing with most reskins of the default tilesets, and what some builders can do is remove the doors from a built area and add placed area transitions if required. But that is entriely subjective since some do not mind the old doors so much. So, it is one of those "your mileage may vary" sorts of things that depends on the individual and what they have in mind for their specific module. As with the doors, so too with the chess set... it makes use of default models and textures linked to in the tileset's .set file. Again, because no new models or textures were made for it. 6. The seams cannot be helped, and are due to the tile-based nature of the game engine... even the most seamless textures will sometimes have that quirk. Howver, with some creative building they *can* be alleviated in the toolset by placing things along the most visible parts. I typically use what are called "seamless" textures in general, in fact... so with some tilesets you'll just get that little visual issue. Naturally, not every tileset has that issue, but many do and I have found it to be a very small thing that is easily worked around. 8. Actually, take a look in the screenshots and in the toolset again... the displayed huts (including the wall huts) make use of H.R. Giger-style textures that make them seem to be a part of the bio-mechanical looking walls. 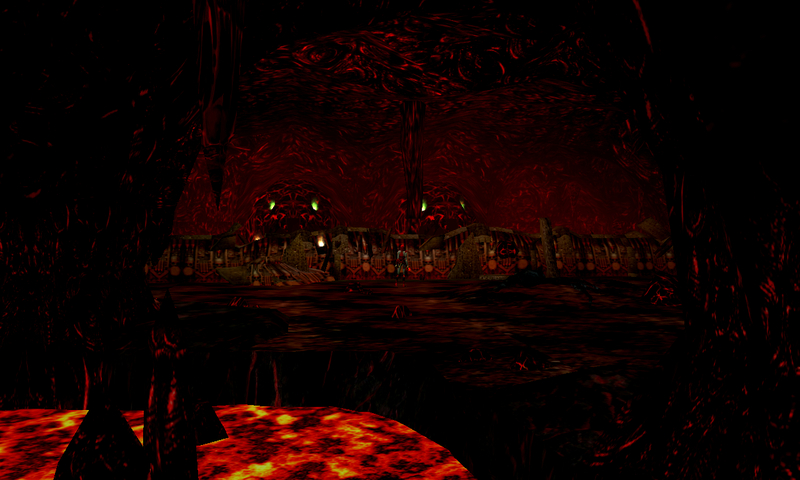 They also have demonic textures featuring devil's heads for their roofs, so they are kind of hard to miss. I found this to be more "natural" for this tileset... wheras human skin would have stood out a bit too much and not blended into the environment nearly as well. As with most things, it is of course a subjective matter. In any case, I just tested it again this moment while writing this in-between and sure enough the huts' Giger-style textures are indeed there to be seen. So it does work, and nicely too. To clear up any future confusion, I have posted that precise explanation (along with some other bits of info) under my description for this tileset above. I have downloaded the updated version and verified that the lava is now animated. Good job. I'm glad to see that you're getting the hang of it. I'm looking forward to seeing your future projects. In terms of voting, this is the baseline: Textures by Six Thrice and Zwerkules are what a 10 looks like these days. This is a good texture but not as good as what those artists put out, in my opinion. As I mentioned above, the seams are glaringingly noticeable to me which doesn't happen with the tilesets by those two artists. With regards to the lighting, I understand the intent to be dark. However, it looks muddy when set to Reset To Black and the PC uses a torch or even set to Interior Dark. Presumably it looks best with Exterior Clear, but I haven't tested it with any other than those three settings. Which is why the lack of an AreaG.ini file is puzzling. Given that you have a specific artistic vision, it would be tremendously helpful if this tileset came with a preset visual setting reflecting the best possible ambient, diffuse, and fog lighting that you as the artist believe it should. That gives us a baseline to experiment. There is also a missed opportunity in neglecting the audio features. I assume that when you use the tileset, you set the ambient sound and background music that suits your vision. As with the lighting, but not as critical, your choice of ambient sound and music conveys to us your original vision and sets the baseline. Granted, a lot of us will change the settings but I think it's a fair speculation that most of the begininng builders will not. The lack of an AreaG.ini file is in my opinion a detraction, especially given the tricky lighting. The mineshaft tile choice is frankly sloppy. If you want it as part of the random floor tile, then it should not be a separate tile choice. Otherwise it is non-intuitive and confusing to the builder to have a choice that doesn't work properly. Five years from now, a builder shouldn't have to look up instructions on how to use the tileset. It should work the same as the Bio tilesets. With regards to the Lament Configuration replacing the crates, it's a nice touch for the square ones. For the rectangle onces, the texture is stretched and distorted. It would look a lot better if the rectangle boxes were a double puzzle box or something else entirely. The wall huts and standalone huts are easy to miss because their color is identical to the wall. With regards to the door textures, creating the texture is the hard part. For the models themselves all you have to do is copy the models, give the copy a new name, and edit the models (with notepad) to replace the old model & texture references with the new ones. Then add the new doors to the doortypes.ini file. So you're not creating new doors models per se, just making copies and replacing textures just like you did with the cave models. With all of the above in mind, I believe it is only fair to rate this six stars. If any improvements are made, I would gladly increase the number of stars. For me, creating a tileset is quite a different affair than creating a prefab area. A prefab area requires already exsiting sound, music, and lighting in order to convey the vision of the one who created it. It is like painting a picture or telling a story in that way.... all of my prefabs do exactly that, in addition to being great assets for builders seeking new areas to add to their modules and game worlds and such. But a tileset is merely a building tool that is designed to be the foundation upon which an area can be built. Regardless of what music or area lighting someone bakes into a tileset, a creative builder is just going to go with their own lighting, music and sound anyway... as well they should, since that is all part of the fun of the creative process, exploring all of those aspects of building something special. For myself, I often have found that the AreaG.ini files... more than not... are not what I myself may have in mind for the way I should like an area to look when I build. On top of that... when a builder combines tilesets (and many do) to create merged .hak files for their modules to save space or to make certain tilesets to work together for various reasons... if they have an already exsiting AreaG.ini file for one tileset, it will just get overwritten when they add another tileset to their merge if that tileset likewise contains one. At that point, the builder has to choose which one (if any) to keep and which to discard. So, realizing that possibility, I chose to make it easier on the builder by not creating a file that some would merely perchance choose not to make use of in any case. In fact, when I created my massive tileset merger project back in the day... Castle, City, Rural & Below Expanded (CCR&BEX)... I had to delete a ton of AreaG.ini files in order to make all of the tilesets merge nicely into the same overall framework whereby they could be used together by builders. As I said, since they all (AreaG.ini files) have that same identical name, only one can be used at any given time... and that to me ran contrary to the idea of that project which was to get them all working together and at a builder's disposal. The only solution was to thus remove those .ini files and thus ensure 100% compatibility all the way around. That became as essential during that project's design, as merging .2da files. Thus, I came to realize that AreaG.ini files are not only unncessary but sometimes they can actually be quite unwanted. So for me, it was only logical to not toss in the .ini file and thus limit what a builder might or might not decide to do with one of my tilesets. My entire design philosophy regarding tilesets has always been to ensure there are no limits imposed upon the builder. No limits, no restrictions, and no imposed notions of what they should or should not use a tileset for. The same goes with my reasons for not including the sound and music already in the tileset. It can and should be added to a builder's taste, to suit their design and desire. Many use the Community Music Project (CMP) or their own music .hak files... the way I saw it, since I was not building a prefab here I felt it was only fair therefore to allow the builder using this tileset to be able to incorporate any music they should like into an area or into areas they opt to build using it. Whereas a prefab is all about the artist's vision strictly... a tileset is one part the creator's vision and one part whatever the builder decides to do with it once they begin building with it. So to me, that decision was also a logical one that made sense in the interests of proviing the maximum creative freedom to the builder. Now yes, I do know that there are methods for combining entries from various AreaG.ini files into an existing one... but to me that seemed and seems unnecessary given that many will just overlook the "default" look of a tileset in favor of their own design and vision in any case. Thus, I have always opted for simplicty over complication regarding the matter. (A lot of builders don't even know that they *can* merge lines in AreaG.ini files and most that I have spoken with find it to be a lot of hassle for very little gain in any case. So there it is. My screenshots actually show my personal vision for this area such as if I were to use it to create a prefab with... from a purely visual point of view. I feel that goes well when it comes to givine a potential builder an idea of how best this tileset could be made use of. Often, when I download a tileset for use in one of my modules I already have an idea in my own mind of what I will use it for. For most builders, it is the same way, and that was how I saw it when I was designing this project. It just made (and makes) good sense. Excellent. I'm all for adding more things hellish. It definitely adds a rather different sort of ambience to the old Mines and Caverns environment, and one I think that a lot of builders and players will appreciate in their Outer Planar adventures. Particularly ones who have seen it all when it comes to Hell environments and are looking for a fresh take on the concept. Confirmed on Mineshaft. Unable to place it anywhere in a blank 8x8 area. Oh, that mineshaft! I finally realized what everyone was talking about. I feel silly for not figuring it out sooner! Regarding the mineshaft in question, it was removed, because it was totally replaced by a completely different method of placing that tile. Here's what to do in order to place the mineshaft correctly using the new system for it... know how when you left-click on an empty floor tile in the toolset it changes a tileset tile's terrain features? Like, to different kinds of rocks, pillars of rock, lava pools and steamy pits for instance. One of the things you can also change it to is the mineshaft tile, which now works that way. Which actually makes the old method of placing it, as a separate tile, irrelevant. In short: just keep left-clicking on any empty floor section and cycle through all the terrains that appear until you get the mineshaft. This is what I meant by the "other" mineshaft when I said: "Oh, that mineshaft!" Oh, and be sure to be selecting the Eraser when left-clicking and not just plain old left-clicking on an empty floor area. Eraser needs to be selected first, of course. Now, I could have probably removed the blank entry for the old non-existant mineshaft tile in the .set file but I figured it was unncessary. So, when I mentioned how the mineshaft works and that I have tested it successfully... that is how (the precise method) that it works... I just tested it that way prior to posting in fact to confirm this. What I can do, however, to make things easier for future builders is I can post an explanation about this in my description for the tileset up above. That way... zero confusion about the new mineshaft tile placing system that was implemented. Sorry for any confusion that was caused by not mentioning this sooner. WOW! I haven't tried this tileset out for myself yet, but just from looking at the screenshots, it definitely brings out something a bit more different and interesting to any of the other dark and/or firery tilesets around here. PLUS...... the BEST part about this one is..... "IT HAS A CEILING!! Hooorrraaahhhh!!" I really do think that every interior tileset should have it's own ceiling now from that of what it used to be like way back when. I don't think I'd like to download one otherwise. It just wouldn't feel right. I really like the very rugged look of the cave walls too. They look quite professionally done. 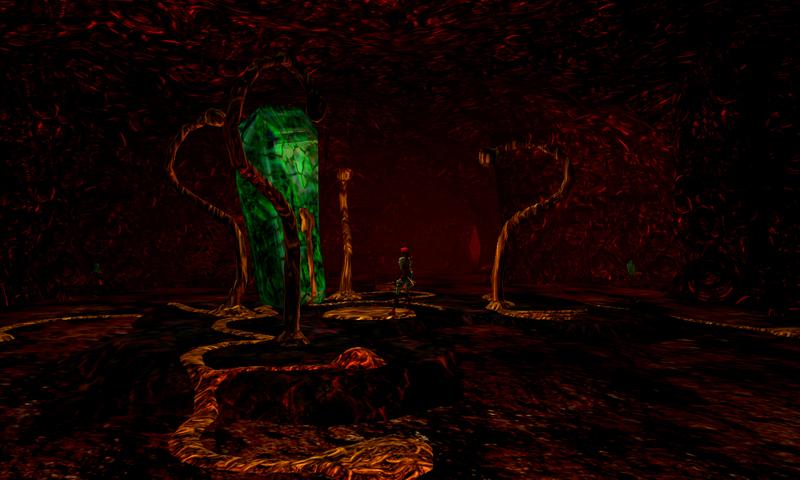 This is a really great tileset for a fire and hellish setting anyway. Very nice job there. Thank you so very much! I was delighted to read your very pleasing comment on my tileset. It makes me most happy to see that you will surely enjoy using it. I totally could not agree more about the ceilings! I always myself feel disappointed when a new tileset comes out that does not make use of some sort of ceiling design. Often, when I build interior areas that do not make use of already existing tileset ceilings I place one of the CEP's placeable ceilings to add the required realism. Such designs make a huge difference, big time! Another option for adding ceilings that is out there is NWNCQ, which adds ceilings to every interior tileset in the game and also adds improved textures to every default tileset borh interior and exterior alike. It also adds some clutter to certain areas like rubble in the crypt tileset and plants in the desert tileset. So it is more than just ceilings, although that is the primary draw to using it. I believe it also comes in both .hak and override formats as well, and has basic and advanced versions depending on how many changes to existing tilesets is desired by the individual user. So it kind of has something to suit all tastes. It doesn't work with all existing modules, but it is excellent for creating new projects with. Though for my part, I tend to use just the CEP when I design area prefabs for release here on the Vault (except in a few rare instances when I wanted to design something really special that could not be achieved with just the CEP alone). In any case, it is cool though that we are seeing more and more options for ceilings and the like as time goes on. Oh, thanks for the compliment about the cave wall textures! I used a lot of H.R. Giger-inspired textures that I found on the internet when designing this tileset... his art really lends itself to extraordinary levels of detail that are ideal for creating truly unique environments with. I can see why they used his art for movies like the Alien series and such... and why they often use something like it in a lot of surreal horror games in recent years (such as Scorn, Agony, and Inner Chains, just to name a few). But of course adapting it for use in a Neverwinter Nights project takes a lot of work to make sure it all comes out just right and remains super detailed to look at in the game. So that part of the creation of this tileset was probably the one I was the most determined about... the visual aspect of things and the tiny details associated with that. All in all, I had a rather specific concept in mind for this project, and I am quite happy with the way it turned out in the end... it looks a lot better than the Hellish Caves tileset that served as the base upon which I created this. Yes indeed, this is perfect for any sort of fire or hellish setting... with more greenish (perhaps a pale greenish just for effect) lighting, it could even serve quite passably for an alien enviroment for science fiction related modules such as those created by the D20 Modern content and module makers. So there is a lot of freedom to do many different and unsual things with this. It is a lot like the tileset work done by (one of my favortie content creators) Plush Hyena of Doom in that way. A basic tileset design that is... beyond its' simplicity... quite complex when put to different uses by builders. ChaosQueen_Kara_8, I'm very glad we're both on the same page here regarding nwn interior ceilings then. At one time back in the day, I did find interiors looked quite bare and really odd without a ceiling. I mean, what good is staring out into a black empty space when you can get a much better feel of what your surroundings are when there is a nice looking ceiling to top it all off? I've also tried using ceiling placeables in the CEP, but I found them a bit awkward to use, not being able to place them to a point where I could see them to look at in a quick demo test module I made with them. When you make a proper ceiling like this, it just feels more realistic I think. I've also seen and downloaded the nwncq too. 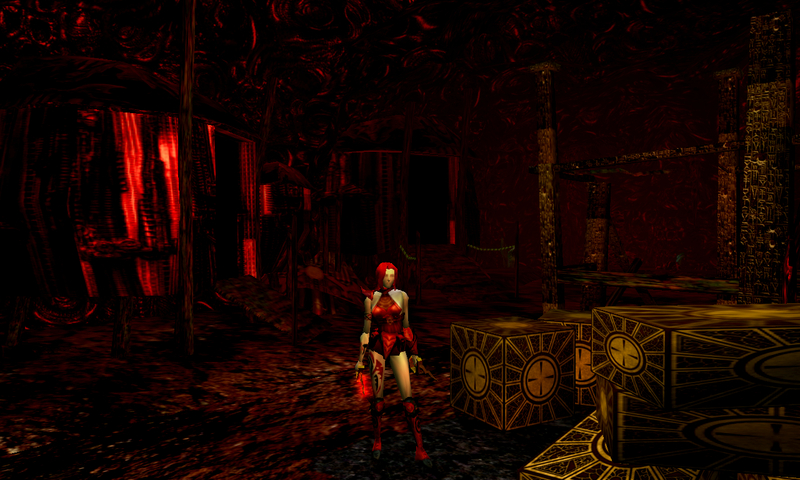 I could see that a decent amount of work went into reorganizing and reshaping the way each original nwn tileset looked. I also noticed how the attention was set to putting ceilings on all the interiors too. It all looks so much different now than what it used to be like back in the day, and much better too I think. I have to admit though..... I am no kind of story teller whatsoever really. I have absolutely no story telling knowledge, or even how or where to place anything at all that is going to impress someone else into being remotely interested in any type of game story that I can dream of telling. Therefore, I would only ever download stuff like this for making my own little private demos and seeing how they look to me ingame. I also download stuff like this when there is a story module made by someone else that I could play. So if anyone out there has made a module using your wonderful inferno cavern tileset, Id be happy to play one..... if I knew of any. I've also seen an downloaded one or two things made by PHoD too. Though for me, I have personally preferred any latest of his/her creations rather than anything made earlier on. I do quite like their egyptian tileset and the wizards Tower with a mixture of different things they made (from the different fancy tilesets, to varying creatures, placeables and items they made) and included in there.